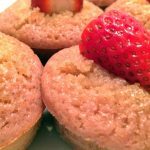 IF you're looking for a strawberry cake recipe with real strawberries, you're in the right place! This strawberry cake recipe doesn't use jello. The vibrant strawberry flavor is truly a celebration of flavor. Puree the strawberries and strain through a sieve (thaw the strawberries first if using frozen). Mix the strawberry puree with the eggs and vanilla. Mix in the lemon juice if using frozen strawberries. In a separate bowl sift together the flour, sugar, baking soda, and salt. Mix together wet and dry ingredients while beating in the butter. Scoop into cupcake liners, bake at 350 for 12-15 minutes. For cake: Split batter between two 9-inch cake pans, and bake at 350 for 25 minutes. This recipe can be scaled down by dividing each ingredient into thirds (for 8 cupcakes).